In shrimp culture model that does not change water or change little water, there will be waste accumulates at the bottoms of the ponds during farming since it is not cleaned. Thus, we should avoid waste being stirred; otherwise, it will pollute the water, reduce the amount of available oxygen and produce toxins in ponds. Experiments show that it is probably better if waste is pumped out during farming to prevent those suspended substances in water of the ponds. Between farming crops, ponds must be cleaned thoroughly to remove waste and keep the amount of organic materials at a minimum rate. In ponds where soil is highly porous, organic matter may increase over the time due to water seepage bringing organic matter into the soil. Thus, pond liners will help limit this obstacle. Every year, ponds should be drained to remove all waste deposited in settling ponds and canals. If waste is not completely eliminated, it will contribute significantly to the increase of organic matter in ponds and make ponds dried up. Oxygen and pH should be measured 2 times per day; NH3 and water clarity should be measured daily. 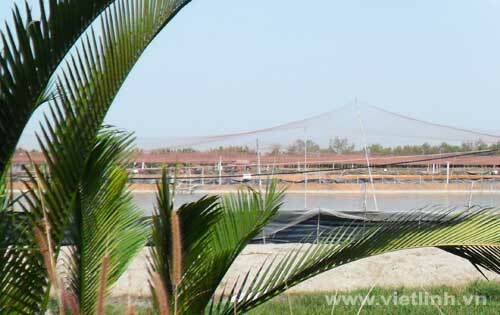 Regular checking helps early detection of obstacles in water in shrimp farming for effective management. Ponds with a lot of organic matters need to use aeration equipment effectively. Models that require little water changes need to combine both water wheel short and long aims. Reservoir ponds also should have good aeration to enhance the activity of microorganisms, which will effectively remove redundancy nutrients in water. People can improve buffer system of ponds by using lime in early farming cycle. Excessive use of lime, especially in the first month of the breeding cycle, will create high pH. Thus, the amount of lime must be controlled. In ponds where water is not changed or is changed barely, plankton can be controlled by stopping aeration and using a small amount of insecticide or BKC (0,1-0,5mg/liter of water) into a corner of the pond. BKC can oxidize organic matters and is gradually neutralized. With a small amount, it will not affect the pond. However it is important not to kill plankton when pH is high in pond because when plankton decomposes, it may generate toxic gases such as NH3. Fomalin can be used to eliminate algae and reduce pH to limit the toxicity of NH3. Those chemicals mentioned above can be used to control some kinds of algae with brown or dark red color. When stopping aeration in an afternoon, algae will float on water. Wind or aeration equipment will gather algae in one position in pond for us to easily get them out.